← Dang the yang: Can we leap forward without the back? Of course I don’t mean that literally. Unless, of course, I do. There seems to be a common point of agreement among modern-day mystics—channelers, wisdom teachers, psychics, shamans, mediums, sages, spiritual catalysts, etc. : We (or, more accurately, our consciousness) create the universe; that is, physical matter comprising the universe—atoms, molecules, skateboards, planets, stars, galaxies, etc. And the tiniest parts of those larger things are mainly empty space: subatomic particles comprising even smaller things, like vibrating strings. Which are really nothingness. And all of these things down to the nothingness are “the source,” which is us. 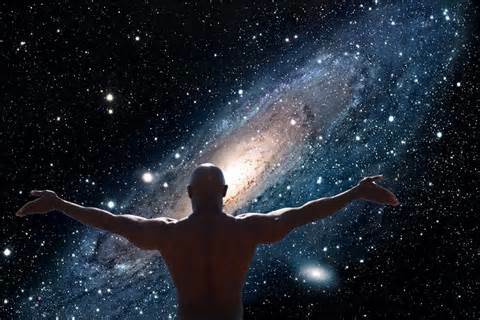 We create the universe, and are also everything in the universe. We are the source. The wisdom teachers claim that all this coincides perfectly with the universe described by quantum physicists—nonlocality, spooky action at a distance, the double-slit experiment, the field is the only reality, and other baffling concepts. Of course, physicists would choke before they’d declare that any of those things prove we (or our consciousness) create the universe. They would charge that the wisdom teachers tend to skew the definitions of those terms. Unfortunately, the physicists’ definitions of those terms are inscrutably fuzzy in the first place. So the wisdom teachers can’t skew them up any more than they’re already skewed. My choice of wisdom teacher this evening was Darryl Anka, who channels a future version of himself named Bashar. Bashar was going on again, like so many of his learned ilk, about how we create the universe, how the universe is more or less humanity’s collective hallucination. It’s as if we all lie and then swear to it. Suddenly an image flashed into my mind that is the subject of today’s rant. Imagine that your consciousness—that is, you—exists somewhere behind your eyes. Imagine that the figurative hands of your consciousness reach out of your eyes and create the scene directly in front of you. Imagine then that your attention—your extended arms, if you will—sweeps across the scene left and right, creating the scene as it scans one way, then the other way. If your consciousness were creating the scene in front of your eyes as your eyes scanned around a room, for example, the room would look no different than it already looks. The existence of the scene in back of you is not provable unless you measure it, or if someone else in front of you is looking behind you. If you were alone in the room, you could hold a mirror in front of you and see the scene behind you—that is, photons from the scene behind you would bounce off the mirror into your eyes and onto your retinas. You could measure the room behind you in other ways—with sonar or radar, or by throwing a knotted rope behind you until it hit a wall or window or something. And then you could hear the knotted rope by virtue of the sound wave it makes, entering your aural canals and vibrating those little bones in your ears, waving those little cilia. However you measure the room behind you, it may in fact not exist until you measure it, at which point the wave function collapses, etc., etc., and the physicists out there are choking. In my opinion, it’s worth a couple of choking physicists to engage in that little thought experiment. Next time, have a glass of water on hand. Nice to meet you. Thanks for dropping by. Posted on August 9, 2015, in Philosphy, physics, quantum mechanics, quantum physics, Spirituality and tagged Bashar, consciousness, Darryl Anka, double-slit experiment, existence, nonlocality, psi, quantum physics, spooky action at a distance. Bookmark the permalink. 4 Comments. Check out Christian Science’s “Scientific Statement of Being”. Interesting, huh? Here it is (and it’s very interesting)! There is no life, truth, intelligence, nor substance in matter. All is infinite Mind and its infinite manifestation, for God is All-in-all. Spirit is immortal Truth; matter is mortal error. Spirit is the real and eternal; matter is the unreal and temporal. Spirit is God, and man is His image and likeness. Therefore man is not material; he is spiritual. Buy bitcoin and earn $10 for both of us. Free. No strings attached. How long until the next U.S.-Russia faceoff over Cuba? Steve Mnuchin’s face: Have you seen it? I’m in love with Caitlin Johnstone. And journalism. Some “new” lessons as the “new” year stumbles in. Yay. Well, here we are. Where are we again? “Nattering nabobs” and the power of words: Whatever happened to…? The master of my domain. Except for your WiFi connection. Want to know gravity? Lay flat on your back. Why would you create something you hate? Can you change your own heart rhythms? It’s baaaack: The Cold War. And It’s on Obama. Should I mourn the death of a police dog? Should I salute the dog? This was my song: How is Elton as a father? With Buckley long dead, who will stand against the far right? Yale students are poorer than their parents. Poorer sense of humor. Poorer tolerance. Poorer judgment. Don’t give me that potential crap. Give me the actual crap. The lost legacy of Hunter Thompson: Is journalism better off without it? Dang the yang: Can we leap forward without the back? Where’s the city of Williamsburg, Va.? Something funny this way comes. So let’s analyze it to death. Are there sticks and stones involved? Write what you know. Or write about wolves. Charity begins somewhere. With elephants, maybe. Buy bitcoin at Coinbase! Earn $10 for both of us! Free! No strings attached! A blog to dedicated to my experiences with mental health.